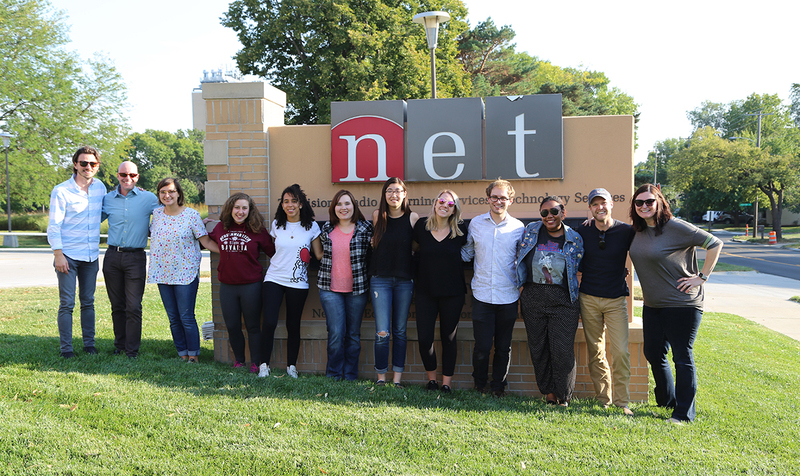 In mid-September, nine students from universities across the country met in one of America's agricultural epicenters: Nebraska. We were here to tell some of the stories found in our country's heartland. Our trip west began in Lincoln, where we first met a group of environmental and science journalists working with NET Nebraska. They shared stories of the characters they've interviewed. The environmental challenges faced by agriculture in the area. And the unique storytelling projects they led. Inspired and with open minds — and ready to get to know each other — we hopped on I-80 in two vans, one driven by Planet Forward director Dan Reed, and the other by Nebraska native and global consumer engagement leader at Monsanto, Holly Butka, who also was the inspiration and lead coordinator for this trip. Our trip would take us to Gothenburg, and to Sutherland — Butka's hometown. We left early in the morning on our second day, with a bit of a drive still to go to get to the Monsanto Water Research Learning Center in Gothenburg. In true Nebraskan fashion, the early morning air was already warm with the sun breaking through the clouds, promising a dry and sunny day. As the drive began, a glance to either side of the road revealed only endless fields of green and gold, scattered with the occasional house and barn. This sea of soybeans, corn, and wheat was periodically broken up by the establishment of rural towns and small watering holes. Prior to this trip, our experiences and perspectives of agriculture — and even rural areas — were varied. Personally, primarily growing up in an agriculture-heavy state like Nebraska, and involving myself in an agriculture college and major, this is not an area I am uninformed about. But just a handful of other students had similar backgrounds, like Kansas State University student Topanga McBride, who was raised in a family working in the dairy and beef sector, and continues to pursue a degree and career in the field. While others knew only so much, knowledge primarily influenced by movies and books. “Before this trip I had a more traditional view of agriculture from what I had seen in ‪'Field of Dreams‬,'” George Washington University student Ilana Creinin said. Getting to hear directly from producers, exploring their family farms, and interacting with researchers from one of the world's largest agricultural companies, all helped to inform and help many of us shape new outlooks on agriculture. McBride stated she has always has a positive attitude toward agriculture, and getting to visit farms in Nebraska has continued to help her understand the diversity and challenges that differs regionally in the industry. An experience like this helped many of the group put a face and name to what goes into producing their food. “I am much more interested in agriculture now. I have much more appreciation for the hardships and discrimination they face in agriculture and their ability to manage the farm operations. I feel like I just have more background knowledge in the field than I did before the trip,” Creinin said. The stories that came out of this trip stemmed from the people we met, and the experiences they shared with us — from the large part technology plays in ag to the view of women in agriculture. For myself, that was learning more about the sustainable practices many farmers use today and how industry leaders are introducing new technology to help producers move forward as they are challenged by decreased resources and even just the personal pressure to be a good environmental steward. Many of these students are taking this experience and lessons learned back to their schools and applying them to classes, work, and their daily lives. This trip helped all of us better understand some of the issues facing agriculture in Nebraska — and also have a better appreciation for farmers and rural life. Said McBride: “I see agriculture as one of the noblest jobs one can pursue, as it is a thankless job that every single person relies on. It takes a strong person to do so successfully and humbly."